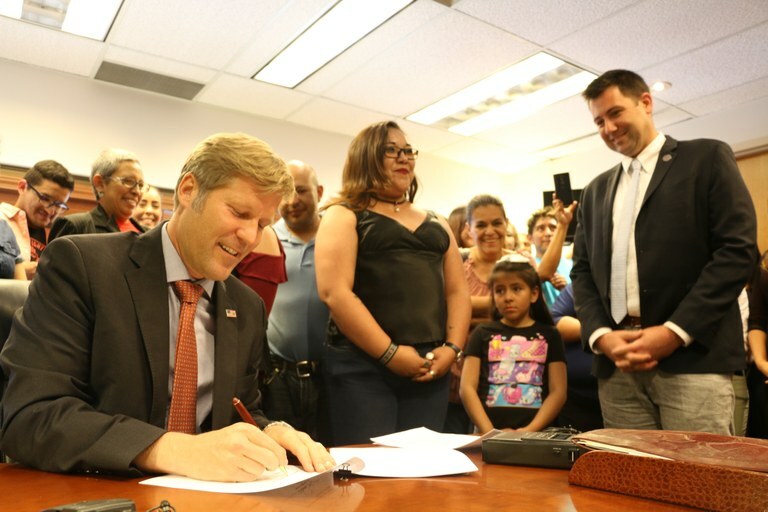 Albuquerque, N.M – On Tuesday, April 24, 2018, Mayor Tim Keller invited members of the immigrant community to his office as he signed a resolution reaffirming Albuquerque as an immigrant friendly city. The resolution is part of Mayor Keller’s commitment to stand up for all families in the city, restore trust between the community and city law enforcement, and reaffirm the commitment to diversity and inclusion. The resolution, sponsored by City Councilors Pat Davis and Klarissa Peña, passed the City Council by a 6-3 vote. The resolution reiterates the city’s policies that prevent federal immigration officials from entering city-operated areas, restrict city employees from collecting immigration status information, and prohibit local tax dollars from being spent on federal immigration law enforcement. “This resolution reaffirms what law enforcement is already doing. We will continue working to increase public safety by going after criminals, and ensuring families can trust law enforcement to respond to crimes no matter their immigration status,” stated Gilbert Gallegos, Director of Communications and Community Outreach for the Albuquerque Police Department. The City Attorney also stated at City Council hearings that the policy does not put federal funds at risk. Mayor Keller has a long history of standing up for Albuquerque’s families. As State Senator for Albuquerque’s International District, he championed one of the most diverse areas of the city, and worked to make sure community policing methods built trust in the culturally diverse area of the city. As Auditor, Tim Keller advocated against threats to the Deferred Action for Childhood Arrivals (DACA) program.